After more than a year of speculation, the baseball hot stove is going to need fresh Cole. The Phillies agreed to send left-handers Cole Hamels and Jake Diekman and cash to the Rangers in exchange for big league right-hander Matt Harrison, as well as outfielder Nick Williams, catcher Jorge Alfaro and right-handers Jake Thompson, Jerad Eickhoff and Alec Asher, according to multiple reports. The deal is likely to be completed on Thursday. Reports have long circulated that the Phillies could trade Hamels, who is under contract through 2018 with an option for 2019. 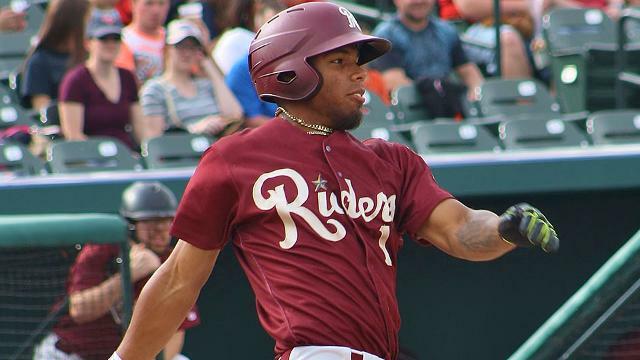 The deal finally came, with the Phillies acquiring five of the Rangers' Top 30 prospects, including No. 4 Thompson, No. 5 Williams and No. 6 Alfaro. Thompson is the highest rated of that group at No. 60 in MLB.com's overall Top 100. Texas acquired the righty from Detroit along with Corey Knebel last year for Joakim Soria. The 21-year-old has pitched exclusively for Double-A Frisco this season, going 6-6 with a 4.72 ERA in 17 starts. His fastball can work into the mid-90s, according to MLB.com, and he works off of it with a plus slider, as well as a curveball and a changeup. Williams is a 21-year-old outfielder who once told MiLB.com, "No one has faster hands than me in Minor League Baseball." The confident Texan has put those mitts to good use this season, posting a .299 average with 13 home runs and 10 stolen bases this year with Double-A Frisco. After striking out in 29 percent of his plate appearances with Class A Advanced Myrtle Beach last year, he's posted a punchout rate of 19 percent this season with the RoughRiders. Williams has improved his pitch selection and approach while maintaining similar power production. Alfaro played 49 games at Double-A this season before an ankle injury likely ended his season in early June. The 22-year-old produced a .253 average and a .746 OPS, popping five homers and 15 doubles. The Colombia native has one of the strongest arms in Minor League Baseball and a tremendous defensive ceiling at catcher, but has been inconsistent, allowing 82 passed balls in 303 career games behind the dish. "That's just a plus arm behind the plate," one opposing Carolina League manager told MiLB.com this spring. "He was really able to neutralize the running game with that arm. "I think he'll get better as a receiver. I think that was typical of a guy still working on his craft. You can see the talent is there." Eickhoff -- a 2011 15th-rounder -- broke out with Frisco in 2014, leading the Texas League with 144 strikeouts while managing a 4.08 ERA. He's worked primarily at Triple-A Round Rock this year, posting a 4.47 ERA with 90 strikeouts in 96 2/3 innings. His fastball has reached 97 mph, reports MLB.com, and he also has an above-average curveball, a slider and a changeup. The Rangers acquired Asher in the fourth round of the 2012 Draft, and he split this season between Frisco and Round Rock. The right-hander owns a 4.73 ERA with the Express, striking out 54 in 64 2/3 innings. He's allowed 16 home runs and a .277 average against in that time. Ranked 29th in Texas' system, he features a low-90s fastball with an average slider and changeup as well as a curveball.